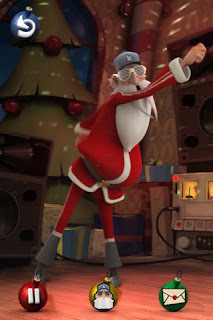 Developer Quote: "Singing Santa listens to what you say, and sings it back in his voice, while dancing to the beat of your favorite holiday tunes." Looking to play Santa this Christmas to your family and friends? You don't have to gain weight, rent a suit or go shopping for a gazillion gifts! Try using Singing Santa instead to sing Christmas carols in your voice and then emailing the dancing, singing guy in red with your greeting to your friends! Don't worry about being a great singer! Simply speak the words you want Santa to say, and he will put it in song to the melody of many traditional Christmas carols with a dose of beat plus an attitude thrown in for good measure. But that's not all Santa does! When you poke (or tap) him, he moves his arms, legs and body in all directions along with a funny sound or two to get you laughing! When you open Singing Santa, you will see the chubby, red man center stage holding a mic. There is a question mark in the top right of the display. Tap this help button to get instructions on how to record your songs, make Santa move, create a video and send a greeting. Okay, now tap the Christmas ornament at the end of the display to get a list of the songs available for Santa. You can also purchase new Dance Moves and New Postcards here. This year send unusual holiday sentiments to those you care about. You can easily do this by saving a video of Santa singing and dancing to your photo album, then emailing your unusual but delightful greeting. If you want to share even more socially, go ahead and post your recording on Twitter. Additionally, you can send a postcard of Santa in a funny pose as an alternative. The cheery, quirky Singing Santa will definitely be a hit amongst Christmas greetings this season! 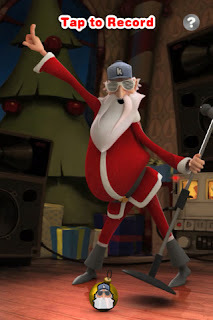 COOL CONCLUSION: "Enchant and entertain your friends with a novel Christmas greeting of Singing Santa crooning your special holiday cheer while dancing along in a funky fashion!"